I don’t have a lot of flowers in my yard, but in late summer, I let the wild sunflowers take over and they attract all kinds of insects. I never know what species will visit, but I can usually rely on bees, grasshoppers, wheel bugs and preying mantises. With this influx of bugs, I look forward to shooting some macro insect photography. 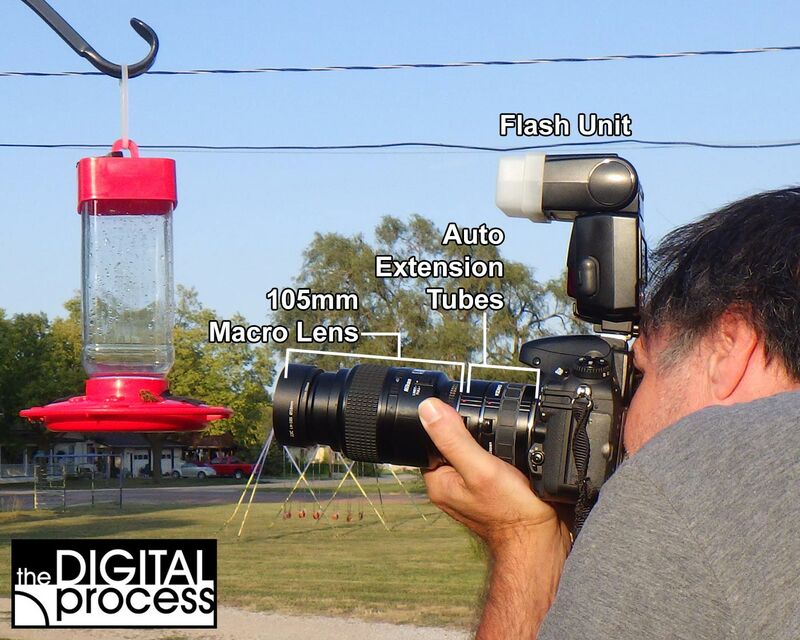 Macro photography is a loosely used tern these days, but in reality it refers to photography where the subject is at a 1:1 scale on the film or sensor. 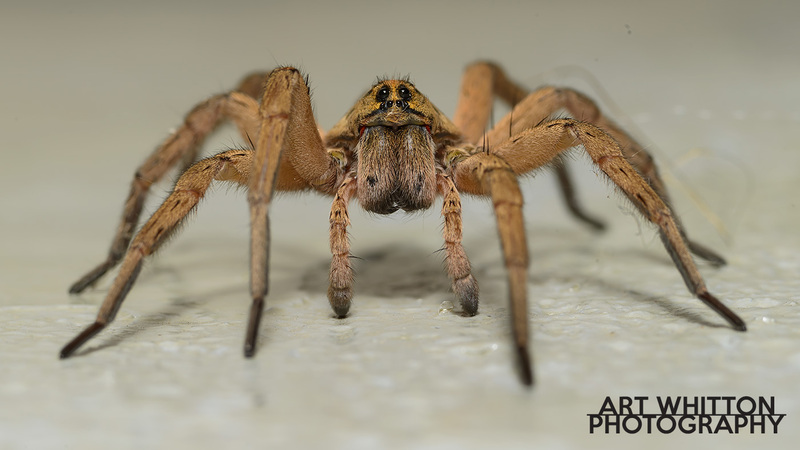 There are few ways to get this close, and you can always refer to my Macro Photography Gear page. If you’re not familiar with macro photography, it’s a lot easier to begin by practicing these techniques on static items like coins. 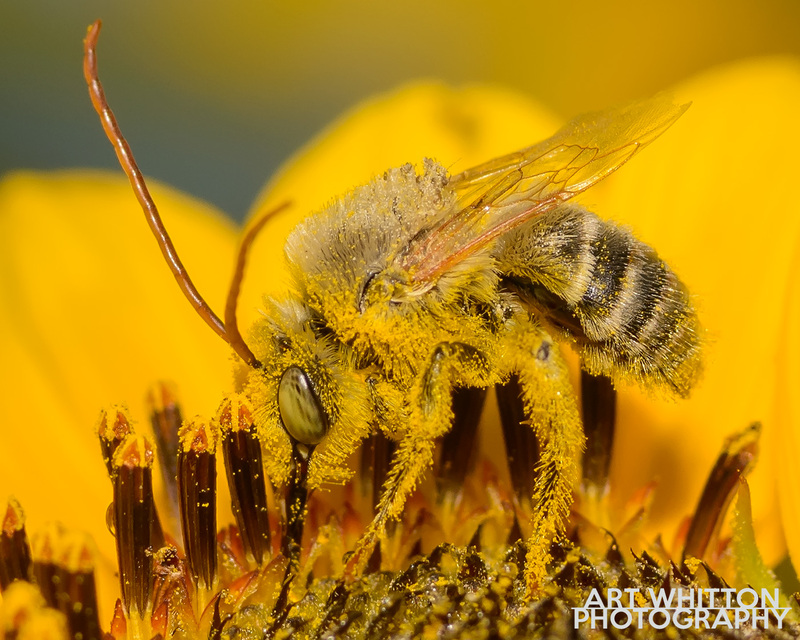 Before we get into the details of shooting insects, remember that they are outside for a reason, and bees in particular support the ecosystem. Try not to stress them out too much, or control their behaviour. When working with insects, I like to work at two levels. On one level I will try to catch the bug and its environment in one shot. On the next level, I will try to capture as much detail as close as I can. For example, a photo of a butterfly on a flower shows the relationship between plant and pollinator (and tells a short story). 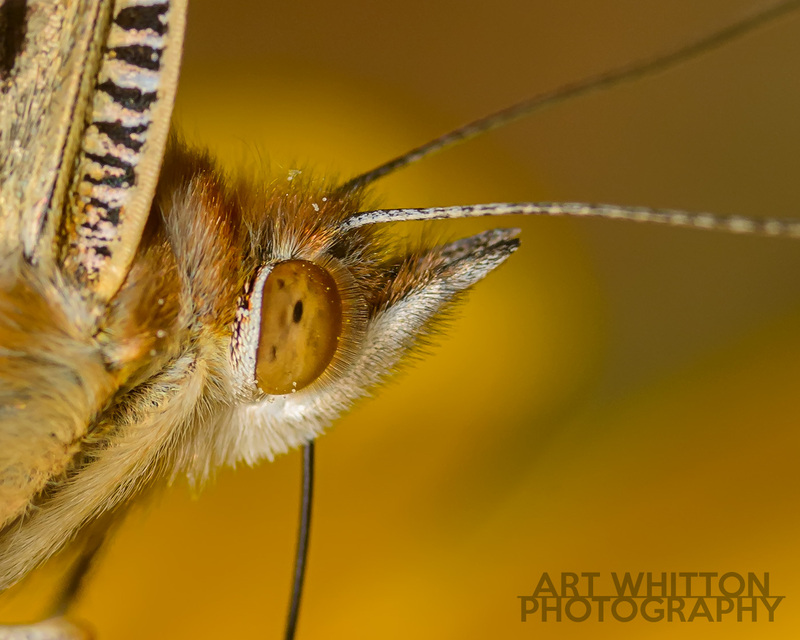 A close macro shot of a butterfly’s face reveals details that most people won’t usually see, and make the insect more interesting. 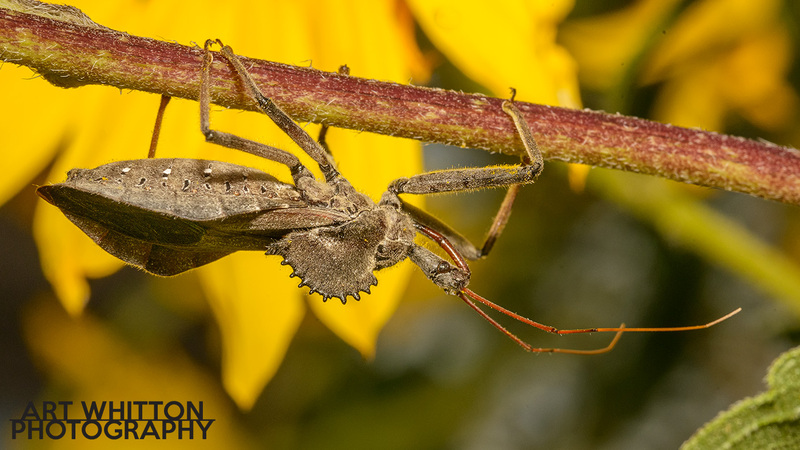 Depending on how close you want to get and how much magnification you want in your shots, your equipment will vary when it comes to macro insect photography. In my case, I will almost always use my DSLR and Nikkor 105mm macro lens. A true macro lens will let me get close to the subject, or further back to allow more of the scene. Some zoom lens include the word ‘macro’ in their description, but very few actually provide the magnification you’re looking for with insect photography. In the end, choose the lens that works best for you. If I require extra magnification, I will use one or more auto-extension tubes. These tubes fit between the body and lens. The don’t have any glass in them, but will just push the lens further away. Auto tubes will also pass on the data between lens and camera for easier operation. I also like to use a flash with my macro insect photography as it lights up the subject and can ‘freeze’ the motion of the wings with flying insects. You don’t need a lot of power, so even a built in flash can help. I use a separate unit with a diffuser. The diffuser does two things for me, it will spread the light out more (which helps when I’m so close) and it provides a softer light. The drawback of using a flash on the camera is that you might get bright reflections on some bugs, especially beetle type insects with shiny exoskeletons. Note that some flash units have a -7 degree bounce for working better with a macro lens. If you have flash bracket, you can use one, but I have found that the extra bulk made shooting a little harder for me. I’ve even built a custom bracket which holds two flashes. It made for better lighting, but was just too heavy to let me enjoy shooting for more than a few minutes. Simple list, and you’ll notice that tripod is not included. You might try a monopod if you find your gear is too heavy, but most bugs move around a lot and it is a LOT easier to shoot if you’re not moving a tripod to each shot. When I’m working on macro photography, I am always using manual exposure mode. The reason for this is that I use a flash or studio lights to add light (and that light rarely changes much). The need for added light is due to the minimal depth of field you’ll be dealing with in macro photography. In general, the closer you get, the less depth of field you have to work with. If you look at the photo of the bee (below, right) and click on it to view it larger, you’ll see that the bee is mostly in focus at f/9. You’ll also see the flower petals behind it are soft, as is the antenna pointing towards you. Even the flower’s stamen just behind the bee are out of focus. I haven’t measured a bee lately, but I’m going to estimate that there’s about 3/16″ (4mm) at the most which is in decent focus. So when it comes to camera settings, your first concern is aperture. You’ll want to shoot at anywhere from f/8 to f/22 (or higher) and your lighting will determine how high of an f-stop you can use. You might not know what works best until you start shooting. Before I go outside to shoot, I will take a few test shots indoors and test my settings. For shutter speed, you will want the fastest setting available to use with your flash. For decades, photographers were limited to a shutter speed of 1/60s (sync speed / flash synchronization speed) when using flash. This was due to the limitations of older mechanical shutters and flash technology. By the 1980s, camera manufacturers figured out how to raise shutter speeds by changing how the flash fires. Now some cameras will let you use any shutter speed, but at the cost of flash range. Since we’re shooting a foot or two away, then the flash range isn’t very important. 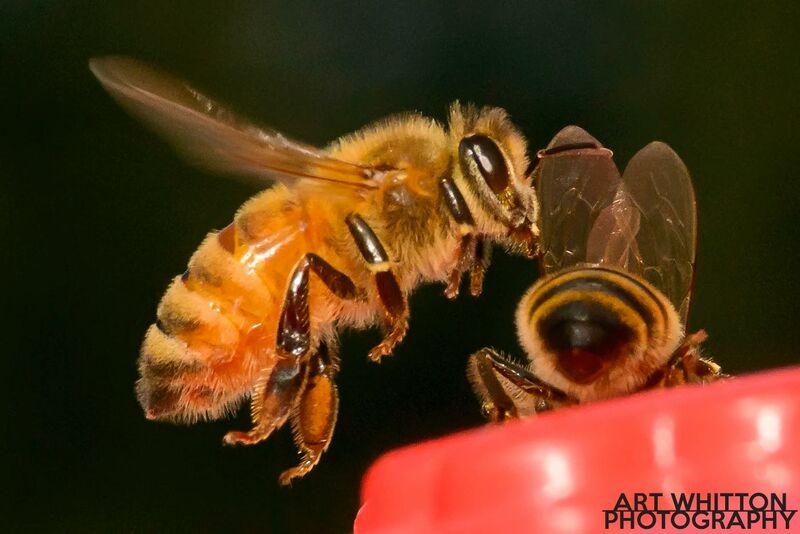 This bee photo (above, right) was shot at 1/1600s with a flash. The higher shutter speed helped to eliminate and camera shake that might appear when shooting so close to the subject. The shutter speed you use will depend on how your camera works with flash. You might be limited to 1/320s (or your camera’s sync speed), but that will still work fine for a lot of situations. The next setting in the exposure triangle is ISO. I generally shoot in this situation at ISO 640-800. This gives me a lot of leeway in setting my aperture and shutter speed, but still doesn’t add much noise to the image. Most flashes have a manual mode and I suggest using this to keep your exposures consistent. I will usually shoot at full or 1/2 power. So how do you find out the best setting? Start with your ISO at 800. Set your shutter speed to the fastest setting you can use with your flash. Set your aperture to f/11. Take some test shots of a coin at the distance you plan to shoot the bugs, see how it looks in your camera’s screen. Make sure to view the histogram to get the best idea of how your exposure turned out. If your photo is too dark, start by lowering your shutter speed. Take some more shots and keep adjusting. Try not to go below 1/320s (or whatever your camera’s flash sync speed is). If you find your photos are still too dark, start lowering your f-stop or raising your ISO. You should soon have a setting that works and the beauty of manual photography is that you can set it and forget it. If I am shooting a static (non-bug) macro subject, then I will use manual focus and take the time to dial it in using live view and a tripod. 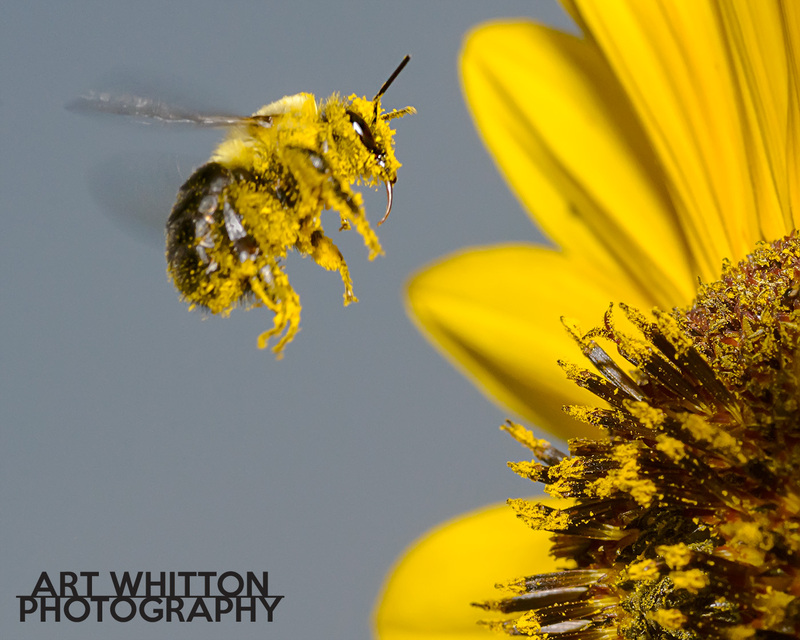 With macro insect photography, there is usually too much movement to use manual focus. If you’re shooting a spider in it’s web, indoors, then you can still use manual focus (and a tripod) to get the sharpest image. I find that focus is the hardest part of shooting bugs. I have my exposure dialed in, so the only other things to think about are focus and composition. I’ll use a wide area auto focus setting, but this might change depending on how large the insect is and how fast it is moving. Wind is also a factor if the bug is on a stem or branch. Learn and practice your focus settings so you can change them quickly. You might find you need to quickly switch from a flying bee to a stationary grasshopper and back again. One nice things about bugs is that they are almost EVERYWHERE! Sometimes that’s not a good thing, but if you’re ready to shoot bugs, it makes life a lot easier. You might find some inside, in your garden, and well – pretty much any place you look. If you’re new to bug shooting, start with insects that don’t move much. Spiders are a great place to start. If you have one in your house that’s built a web, you should be able to walk up to it and start shooting. In most cases, it will put up with you and your flash and stay in place for a little while. The wolf spider to the left appeared after I cleaned up an area in the basement. It stayed out on the floor for a couple of hours and let me get about 10 inches in front of it and take as many photos as I liked. I even went back a couple of times to get better photos until I ended up with this one. If you have a garden, you’ll find there are a lot of subjects there you can start shooting. One big problem when you move outside is wind, which will make macro photography a lot more difficult. So again, practice your techniques indoors, and shoot a lot outdoors! Bugs make such interesting subjects, and the closer you get, the more features you can see. Remember to respect them as you would any other wildlife, as they all play a role in our ecosystem. Thanks for reading, and if you have any questions – please leave a comment below.